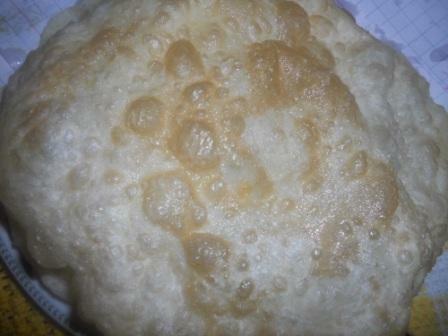 Delicious Puffy Poori also spelled as Puri , is a popular breakfast recipe across Pakistan. it is a small disc shaped bread which is made from whole wheat flour. It’s a good alternative of roti or plain paratha and involves similar directions and ingredients that is deep fried in oil and served with Halwa, any veg curry like aalo bhaji, special Cholay, pickle, Onion with lemon. It is a highly selling breakfast dish in Punjab and other parts of Pakistan. In every hotel we can find pooris served on the breakfast menu and its such a delicious dish but one can stay away if they are health conscious as these are deep fried in oil. While most people make poori using wheat flour, some make with maida or with a mix of atta, semolina and maida. Each lend a different texture and taste to the pooris. Poori recipe with step by step photos and tips. Crisp, golden and soft pooris are made with whole wheat flour, salt and water. It is a very popular Pakistani fried bread. If you need some variation then you may add suji or semolina which helps you in making a perfect puffy poori. There is another slight variations in making poori and those are nothing but some like to knead the dough with milk instead of water and that option too gives us a soft poori. Here in this recipe I used water to knead the dough and yet I got very soft pooris. If you want pooris lasted soft for many hours then let them keep in hot pot. Whether we add water or milk for kneading, the final outcome almost remains the same. Pooris are an important part of festive occasions as well. They are often had for breakfast, although, you can prepare pooris with a curry or sabzi for lunch or any time of the day. In this post, I have shared the basic method of making pooris. Try this simple and easy recipe if proper tips and tricks are followed that make your lunch or dinner a bit different. Perfectly made puri not only puff up well when fried but also don’t soak up much oil. Take a large bowl, sieve wheat flour, add suji, and salt. Add oil and mix well with your fingertips, so everything is incorporated well. Sprinkle water little by little and knead until a soft dough is obtained. It must be stiff and not soft or too moist. It must not be too dry or crumbly as well. It should be smooth and tight (NOT SOFT like roti or chapati dough). Cover the dough and rest it for 30 to 45 minutes. Remove the cover and press the dough again. Divide the dough into equal small lemon sized portions. Make smooth ball out of it. Flatten it out between your palm and make disc and cover with clean cloth. Apply oil to dough ball so that it do not stick with board and while frying, the oil stays clean. Now with the help of your palm and finger tips, make disc. You can make use of rolling pin to roll the dough on rolling board. Roll the dough about 6-8 inches diameter and thickness of 1.5 mm to 2 mm approximately. Heat cooking oil in pan or kadai over medium flame for deep frying. When it is sufficiently hot check whether oil is hot enough by dropping a small amount of dough in it. If it immediately comes to the surface, oil is sufficiently hot. Once hot, carefully slide rolled disc in oil and by very gentle pressing using back of slotted spatula fry them. It will help poori to puff up. When the poori puffs up, flip and cook the other side till golden brown. This entire process should not take more than 30 to 60 seconds. Drain and transfer the poori out on a tissue paper or paper towel. Similarly deep fry rest of the pooris. Serve poori hot with a vegetable curry or sweet dishes like suji ka halwa aloo ki sabzi. The dough for poori must not be sticky or loose i:e it must be a tight dough, that helps in puffing and soaking up less oil. Use up the dough immediately and do not rest it. Depending upon the stove and hotness of oil frying the poori on a medium high flame works well for me. Do test for first one before starting. Using too much of suji or semolina can make the poori hard or the top layer can turn too crispy. You can use about 2 tsps per cup of flour. Take wheat flour, sooji, and salt in a large bowl. Divide the dough and make smooth ball out of it. Flatten it out between your palm and make disc. Apply some oil to dough ball so that it do not stick and while frying, the oil remain clean. With palm and finger tips, make disc. You can make use of rolling pin to roll the dough on rolling board. Once oil is hot, carefully slide rolled disc in oil and gently press using back of slotted spatula to puff up. Serve hot with Suji ka Halwa. The dough should be slightly stiff so that less amount of flour can be dusted on the pooris. If you use too much dusting then while frying the flour particles burnt in the oil and stick to the later batches of pooris that you will fry. To avoid this while rolling, apply a little oil on the poori and then roll. Make sure that the oil is neither too hot nor cold. if hot, then pooris get browned quickly. if not enough hot then the pooris absorb oil and become too oily. The pooris should puff while frying. 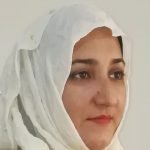 If not, then something has gone wrong….. either the dough has not been kneaded well or the pooris have not been rolled out evenly or the oil is not hot enough. Ajwain (carom seeds) can also be added which is very helpful in digestion. It is used in pooris as pooris being a heavy food can be difficult to digest at times. What do you like as a side dish with poori? Please let me know in comments below. I will add that recipe too. I like Aalo ki bhaji, suji ka hlawa, cholay, onion with lemon, pickle. TRIED THIS RECIPE? I would love to hear from you. If you tried this recipe then rate the recipe or leave a comment below. If you like this recipe then do share as well on facebook, twitter and pinterest. Pooris are really delecious especially when eaten with halwa and chanay. I tried this dish and really liked it too and suggest everyone to try it too.